Congrats to Robin B., ChiIL Mama's family 4 pack ticket winner ($32 value)! 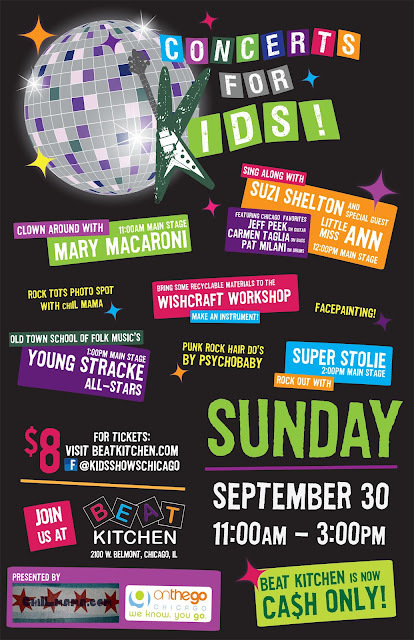 We'll see you tomorrow--Sunday 9/30 from 11 to 3pm for a day of rockin' awesome kindie fun. Be sure to say hey to us upstairs at ChiIL Mama's Rock Tots Photo Spot! We'll have loads of fun dress up clothes and instruments for you to try out, and free ChiIL Mama stickers, too. Tickets $8 - available online at http://www.beatkitchen.com/ or at the door. All activities from music on the main stage to face painting, crafts, punk rock hair do's, and ChiIL Mama's rock tot's photo spot (dress up & instrument petting zoo) and more included. *Please note, Beat Kitchen is now cash only. First 50 kids get maracas from On the Go Chicago. pieces of cardboard, toilet-paper tubes...) and Wishcraft will show you how to make a musical instrument. Wishcraft is a fun ordinary workshop in Roscoe Village in which young artists grow to become confident in their creative freedom in art + craft classes, day camps, clubs, after-school programs and birthday parties. taught within the context of relevant projects with a no-judgment philosophy. Sunday noon shows for non-Fest shows are still just $6. Click here for our original video interview with Brooklyn Kindie Queen, Suzi Shelton, and live show footage from The Beat Kitchen.